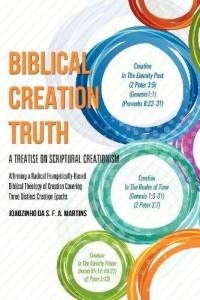 BIBLICAL CREATION TRUTH [Coyright @ 2012] differs from the traditional and recent controversial theories of creationism. Contrary to the prevailing confusing theories of creation, the “heavens and earth” of Genesis 1:1 were actually perfect (Deuteronomy 32:4) and very beautiful (Ecclesiastes 3:11). Genesis 1:1, in just one short blessed sentence, covers within its grasp the ‘totality of a perfect creation’. This fact is corroborated by Proverbs 8:22-31 narrating the primeval creation. In no way, Proverbs 8:27-31 are ‘parallel’ with Genesis 1:3-31 but actually complement Genesis 1:1 with additional details. Next, Proverbs 8:27- 31 does not mention chaos on the primeval earth thereby proving that the chaos of Genesis 1:2 was of later occurrence. Moreover, Proverbs 8:26c –31 prove that the original earth was teemed with life, including pre-adamic ‘sons of men’ in whom Wisdom delighted. This could not be the case after Adam’s fall seeing that God would never take delight in any fallen sinful ‘sons of men’. Undoubtedly, a faulty interpretation of Genesis 1:1-31 and Exodus 20:11 lies behind the ‘battle for a true view of the beginning’. If these Scriptures, along with Proverbs 8:22-31, were objectively interpreted, taking into account Genesis 2:4a relating to beginnings, it would be clear that there were two beginnings of God’s creative works; one, in the eternity past (2 Peter 3:5) and the other, in the realm of time (2 Peter 3:7), leaving no room for any debate relating to the origins or the age of the universe. It’s time Christians admit their failure to consider all the Scriptures relating to creation and interpret the biblical creation accounts appropriately! And next, with realistic living faith, come to grips with the actual revealed Biblical Creation Truth, for ‘His Name’s sake’; even as we look forward to the creation of new heavens and earth in the eternity future (2 Peter 3:13)! Undoubtedly, the new heavens and earth will not evolve through billions of years nor the same created in six days but, almost instantly, by fiat! >>> Kindly SHARE this website with others, online. Thanks! This entry was posted in Uncategorized and tagged Biblical Creationism, Biblical Gap Theology, Evolutionism, Pre-Adamic Life by JOAOZINHO da S. F. A. MARTINS. Bookmark the permalink. Yes, God will not allow anyone to distort His holy Word.